everyone that came out for the opening. I was super stoked on the turnout! SPECIAL THANKS to those who bought new Jolly Roger or Guano decks and Guano wheels. NO THANKS to corporate pigs and politicians. 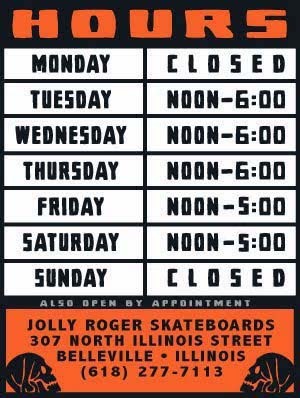 We will be running the $35 Jolly Roger deck deal for the rest of the weekend so come on in and pick up a new stick. * Lindenwood University did a great job on providing the midday refreshments. They were much appreciated and none went to waste.